A fully stocked fridge with food you actually want to eat is a beautiful thing. Delicious dishes you can grab and eat quickly for those times when you’re busy, and ingredients to put together and cook when you have a little more time. Today, I want to pull back the curtain and show you exactly what I do to set myself up for a week of successful eating. My approach to food prep is one that finds a happy balance between variety, delicious flavors, and metabolism-boosting meal combinations. I like having some guidelines to follow AND some room to deviate from my plan. Now granted, from a practical and financial standpoint I have to be smart about how I choose the foods I want to cook for the week, because too much variety means I’ll have to get a ton of different ingredients. So I strategize by choosing a few different recipes that have complimentary ingredients, using some fresh and some frozen to save money (and to make sure things don’t go bad), and buying things I plan to use over and over in bulk. Here are 4 steps I take to ensure my food prep is quick and effective. The way I choose my recipes is pretty simple. I want all of my daily meals to include a balanced amount of protein, vegetables, healthy fats, and occasionally complex and simple carbs. I include some protein with every meal. I am on the go right when I wake up so I don’t like to think of what I am going to have for breakfast, it is the same thing every morning for that week. Then the following week I will switch it up but still have the same thing every morning that week. 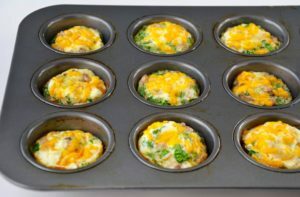 For example I made a batch(12) of egg white muffins (recipe to follow) on Sunday and I had all my breakfasts set until the following Saturday. Organize what you plan to have for dinner, what leftovers you can take the next day, what you can make in bulk etc… I always have at least 8-12 hard boiled eggs in the fridge for a quick go to protein and healthy fat snack. So this part is pretty easy. Just pick the recipes you’re going to make, decide if you’re going to double them or make the amount it calls for and start writing your grocery list based on the foods you’ll need. Additionally, you’ll want to think about the meals and foods you won’t prep in advance, and can have on the fly. For example, add-ins (like berries, or chia seeds) to your smoothies or maybe you want some canned tuna on hand that you can mash together with avocado for a quick and delicious snack or meal. I always make sure I have some frozen fish/meat and frozen vegetables in the freezer too. Having things on hand that won’t go bad is super important. I also make sure I have good quality protein powder always on hand for a quick and easy on the go snack. I have lots of glass containers for my food. If I am going to store stuff I try to stay away from plastic. The clear glass is a great way to see every option when you open the fridge. I also have lots of different sizes so that if I know I am going to be bringing food with me a lot that week then I separate my food in easy to grab and go meals. If you are someone who tends to over eat then having meals measured out ahead of time in their own container will help control that tendency. Sometimes it takes a couple hours to put everything together. In fact, if you are doing it right, it always takes a couple of hours! While doing food prep can seem time consuming, I find it extremely efficient and it saves me a ton of time during the week (and money – because you’re not shelling out $ on lunches out, snacks, take-out food, etc). Not to mention it absolutely ensures I’m going to be making the best choices for my body all week and not relying on pre-made foods that have too much sugar, salt, additives or ingredients that might not be optimal for my health. 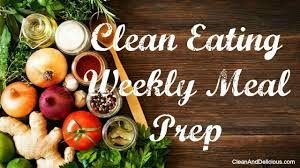 It is not always seamless, and I don’t do it every single week, or I may be short on time and only do food for 3 days knowing that I will rely on food I prepped and stored in freezer for the rest of the week, but I do my best to do food prep 2-3 times a month. I also always ensure that I make enough of at least one or two items that can be frozen for another week just incase. 1- boil my eggs, (on the go snack) while boiling I wash and chop up all the fruits and veggies that I will need for all the recipes, salads and on the go snacks and spiralize my zucchini. This way I have it all done and out of the way before the meat comes out. Eggs are DONE! 2-place the veggies I am going to eat raw as snack or in salads in a container and into the fridge. DONE! 3-place the spiraled zucchini off to the side on paper towels and sprinkle with salt. This will pull some of the water out before storing. I make enough to serve my family for one meal of zucchini noodles and to have some left to put on top of salads at lunch. DONE! 4-cut chicken breasts into cubes and marinate in fridge (see recipe). 5-Heat up oven, and get soup pot ready for soup – saute onions in olive oil then add asparagus, broccoli and water, bring to boil. At same time steam green beans. 7-Once green beans are steamed transfer to pan with melted butter and garlic and toss. Put aside to cool. Again I make enough for 2 dinners as a side for 4 people DONE! 8-once muffins are done remove from oven and place sweet potatoes in to bake. 9- once asparagus is bright green and broccoli is tender remove from heat and let cool. Then blend with hand held blender while adding a splash of lemon and 1 avocado salt and pepper. Set aside to cool and then refrigerate DONE! 10-Remove sweet potatoes and mash half of them and leave enough to serve 1 to each family member intact. 11-Place chicken cubs on skewers and bake in oven. 12-make a huge batch of meatballs (lean ground beef, egg whites, onions, spices) while chicken cooks then place in oven once chicken is done. 13- When meatballs are done I freeze some, store some in fridge for the week and I keep some aside to make the stuffed sweet potato later that week. ** Pork tenderloin and the salmon filet I don’t cook ahead of time but I always get enough to have left overs for dinner or lunch. Place chicken cubes in ziplock and pour in marinade. Place in fridge for 30 min. Remove and place on skewers and bake in oven at 350 until juices run clear. Using your previously baked sweet potatoes, cut a slit in top and remove the flesh. In a bowl mash up a few of the meatballs you prepared and mix with sweet potato, salsa, chives, and spices (I like tex mex). Stuff sweet potato skins and sprinkle with cheddar cheese, bake in oven until warm. Serve with side salad. ← Belly Fat: why won’t it go away!! → Try This HIIT workout!